Wet Wings sows seeds of beauty and elegance, but fails to reap much lasting wisdom. 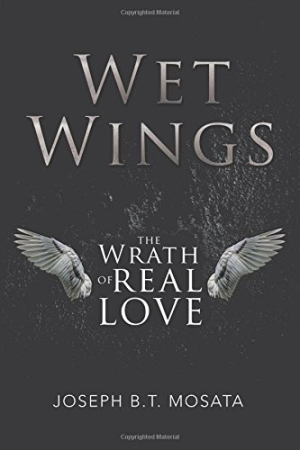 Joseph B. T. Mosata’s protracted romantic fantasy Wet Wings features a lovestruck biracial couple who are aided by angels in defeating their demons. Melodramatic narrative turns also confront troubles in Africa. When South African native Quinton Barker steps out of his London flat wearing black to match his mood, he avoids the homeless man he sometimes greets. This man’s sad tale of lost love foreshadows Quinton’s own dire future—not only his introduction to an exotic stranger, Juliana Rose, with whom he falls instantly in love, but also his place in the broader society of haves and have-nots. Juliana and Quinton’s love is threatened by dark secrets about how Quinton’s family makes their money. In and out of consciousness after an accident, Quinton enters a magical dreamland inhabited by the dead; angels and demons are out to either protect or destroy him. Quinton’s actions in this alternative space define his earthly future. It is easy to get swept up in the book’s budding romance. It throbs with youthful lust; Quinton ends one affair to run to Juliana, and can’t even stay loyal to her. As the couple falls apart and comes back together, traveling from Europe to Africa multiple times, the novel, too, comes apart. The breakups and reunions become predictable and repetitive across a stream of chapters. The couple doesn’t talk much, except to express rage or love. Juliana wishes that Quinton would discuss more with her; his inability to communicate carries over into the text. Phrasing is awkward and unfamiliar, and the tone throughout is stilted. The plot moves along because of dreams as much as it does through waking actions; the characters spend a lot of time in repose. As endearing as they are to each other, they come across as entitled and lazy. Either in bed or alone, Quinton and Juliana worry about the sincerity of the other’s affections. Juliana gives up music when she’s with Quinton; though he is in school, Quinton barely studies. Toward the end, when Quinton is largely unconscious, the action in the netherworld of his subconscious turns swift and steady. The angels working on Quinton’s behalf aim to effect changes in Africa’s waking future through him, and to secure a greater degree of harmony and equality modeled by Quinton and Juliana. That the characters develop more in this dreamscape than in reality makes the work more fantastical than plausible. Quinton Barker hopes for a better future for himself and his homeland. Making a family with his true love, Juliana Rose is his solution. As a misconstrued fable, Wet Wings sows seeds of beauty and elegance, but fails to reap much lasting wisdom.